Irene Bain has already enthralled us with her Wartime Memories, published as Local History Notes 7. In this, her second set of reminiscences, she shares her recollections of her childhood – at home, at school, and out and about with family and friends. stood in a row outside – a rare treat. I joined the Brownies, whose meetings were held in the Ascension Church in Sherwood Park Road. owl was put to sit upon the red-spotted toadstool, as he always was at meetings. learnt a most important lesson in life. go a little way inside and shout, “Oxford, ha ha”, and run for it! next morning all the children were talking about this great event. played musical chairs and pass the parcel, the music being provided by the wind-up gramophone. for having me”, to our friend’s mother as she stood graciously by the door to see us out. home from working in Ceylon. In front of the fireplace lay a single small rug, for there were no carpets for ordinary people then. not furnished for many years, as it could not be afforded. by a most violent explosion. The rest of the house had been painted in various shades of brown – the fashionable colour then. had been left on the windowledge. day I could see all the way up to Pollards Hill. and we did, far and wide. house in the 1930s shows the quietness of the street then. there. It is now a sad industrial site. not easy. The vicar also called to visit her, so it was all quite serious. When I was about seven I had to go into the Wilson Hospital to have my tonsils and adenoids out. the Health Service and doesn’t function as it was intended to, which does seem a great pity. saying a proper goodbye to him and have always regretted that and been sad about it ever since. second was at the other end of the hallway in a heap. Not a good beginning for a home visit! The Wilson Hospital, built in 1928. Heidi. Upstairs there was even a small dance hall as well. once I remember seeing a full stage show at half time and Billy Cotton’s band playing, too. really was a long way away. safe for him to proceed. her over the years and sincerely hope life turned out better for her. have been given to the poor lady. We went on with our walk. for each letter, which we all had to call out. Solid grounding, I believe. bare feet without getting splinters, while we pretended to be fairies or giants. with a bow on top completed the hairdressing. to hold up their short trousers in Summer. Going to school in Winter I was snug in a thick brown coat and a matching, brimmed, velour hat. the places coloured pink on our Geography maps of the world. but this act was typical of her. up and down the pavements. There were Mabel Lucy Atwell books with pictures of chubby children on the covers. We children really thought there might be a man in the moon, as we were told. snow-covered Pollards Hill, all countrified then. by the vicar himself, and a treat it was, too! the blossoms of the may trees and organising our ladies in waiting. Summer was a time for picking buttercups, which grew in profusion on the edge of the Common. handed down from generation to generation by children. out to the most accessible islands. village, passing the watercress beds. we had had our rides! every family possessed one. Crumpets were also toasted in this way. of the chimney pot and then dash back to tell him. on his bike. The clearing up for the housewife would be something else! play at skipping. A long rope would be held out stretching from one side of the road to the other. the beat of the rope altering. Of course, turns would be taken at the swinging of the rope. opponent in the game was a thrill. but we did not know that then. We played ‘He’ or ‘Touch’ and leap frog. I had a toy Sunny Jim, but somehow was never comfortable with his image. there was the Ovaltinies programme for children. with butcher, dairy and grocery sections, all separate. beans as we walked past it along the High Street. You could buy 1d bars of chocolate from slot machines on the station, if you had a penny! Dad smoked Woodbines and you could buy five in a packet if you wanted to. Milk Tray at Christmas for 6d – all in a lovely purple coloured box – if you had saved enough money. Another present was a 6d bottle of California Poppy scent – and it smelt lovely, too. dabbled through the water. The use of the bluebag was supposed to make the whites appear whiter. stings. Some of the clothes were then starched. lettuce and radishes from the garden and often a caraway seed cake, which I didn’t really like. and thought it absolutely marvellous with its appley bubbles. be left in the pram outside the shop. round hats and delivered telegrams by bike. who got to know they could get to the milk through the cardboard milktops. window beside the front door. and buy groceries. One of my memories is being sent there to buy half a quartern of self-raising flour. in the way of pocket money, but I never felt deprived. The shrimp man went the rounds of the streets on Sundays. for old clothes you wanted to be rid of. be done outside on the pavement. reassuring to know that we had plenty of coal for the Winter. she hastily shovelled some coal into the bucket and then dashed back indoors. was alight and by the time the sticks were crackling away, the coal had caught fire and smoke arose. 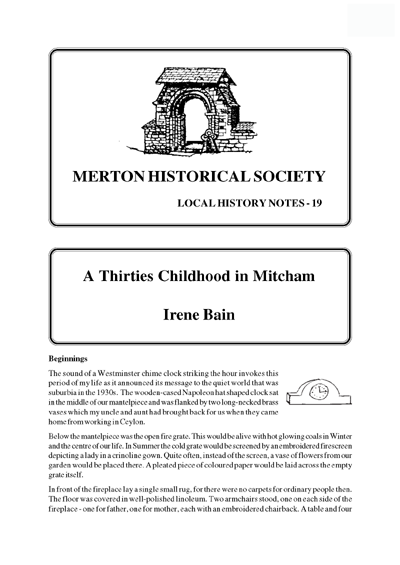 This entry was posted in Publications, Local History Notes and tagged in mitcham, Reminiscences, urban mitcham.